What does that mean for Memphis? With their overemphasis on crime and safety in the urban core, Memphis' TV-news stations already affect a potent, subtle, and effective right-wing bias. Today's media news suggest things are about to get less subtle. On Monday, May 8, Tribune Media Co. announced its 42 television news properties, including Memphis' WREG-TV, would be acquired by Sinclair Broadcast Group for somewhere in the neighborhood of $3.9 billion. If approved by the FCC Sinclair, will operate 233 stations in 72-percent of America's broadcast markets. The company will additionally assume $2.7 billion in debt. 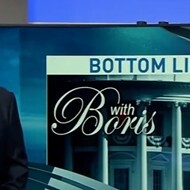 Sinclair has a long, unapologetic (though occasionally denied) history of aligning itself with conservative politics and making local news less local. There's no point in repeating the origin story when this Memphis Flyer Viewpoint from 2003 does such a fine job of condensing things. Like many a media empire, Sinclair grew through a combination of acquisitions, clever manipulations of Federal Communications Commission (FCC) rules, and considerable lobbying campaigns. Starting out as a single UHF station in Baltimore in 1971, the company started its frenzied expansion in 1991 when it began using "local marketing agreements" as a way to circumvent FCC rules that bar a company from controlling two stations in a single market. These "LMAs" allow Sinclair to buy one station outright and control another by acquiring not its license but its assets. Today, Sinclair touts itself as "the nation's largest commercial television broadcasting company not owned by a network." You've probably never heard of them because the stations they run fly the flags of the networks they broadcast: ABC, CBS, NBC, FOX, and the WB. The new deal, which also gives Sinclair part ownership in the Food Network, still requires FCC approval, but, as noted by CNN, the Trump administration has shown nothing but interest in approving these kinds of mergers. Once approved Sinclair plans to swiftly liquidate all real estate connected to Tribune Media's print holdings. That makes sense since, as noted by The Baltimore Sun, Sinclair Broadcast Group does two things very well: "It knows how to run local stations lean and mean. And it makes some of the most visually engaging local news in the country." The Sun also notes Sinclair's history of "compromising its news operations with right-wing politics." Of course Sinclair's only putting its mouth where its money is. Last month Trump’s FCC reinstated a something called the UHF Discount allowing media conglomerates to blow through congressionally set ownership limits. The UHF Discount is an obscure rule from 1985 before the transition to digital eliminated the UHF/VHF signal gap. It allowed owners of UHF properties to declare half the coverage area reach compared to a VHF station.